Russian artist Roman Booteen (featured previously) continues to create some of the most interesting ‘Hobo nickels‘ we’ve ever seen. 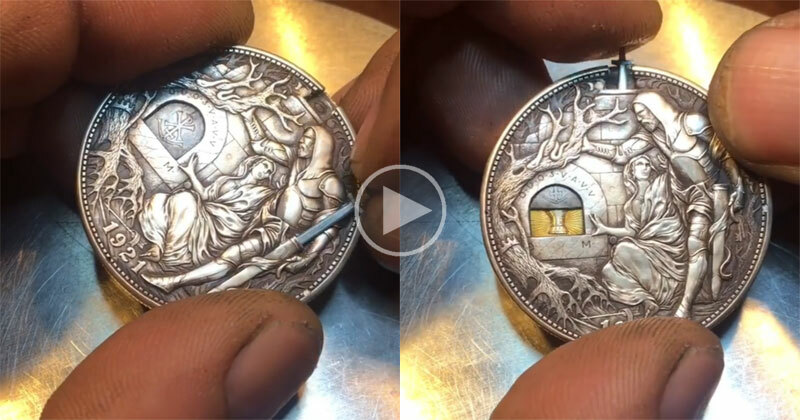 In his latest artwork, Booteen engraves a US Silver/Morgan dollar and adds a secret door that is opened by removing the knight’s sword and inserting it into the top of the coin. Although not quite finished, you can see the amazing work in progress below. Like all of Roman’s other custom-engraved coins, this one will be sold on eBay when completed. For more amazing Hobo nickels and other engravings, check out Roman’s work at the links below.